Whether you need a door fitting, to a new built in custom fitted wardrobe we are here to help, we can work on any of your carpentry or joinery projects. 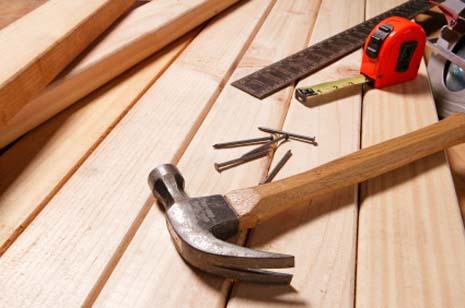 Our qualified carpenter and joiner serves Peterborough and the surrounding areas and can help with door fitting and flooring. Our carpenter can also be of help with Flat Pack Furniture assembly. A few of our most popular jobs include: Laminate and wood flooring, Built in wardrobes, Door hanging(internal & external), Door frames, architrave, skirtings, decking, Fencing, Boxing in pipework, Staircase spindles, Loft hatches and loft ladders, Loft insulation, Loft boarding, Picture rails, Dado rails etc.. Please call whatever the job, we'll be glad to help.